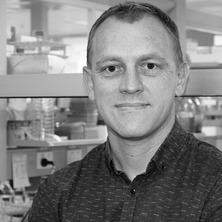 Brett Collins is an NHMRC Career Development Fellow and head of the Molecular Trafficking Lab at UQ's Institute for Molecular Bioscience. He was a lead investigator in the seminal structural studies of AP2, the protein adaptor molecule central to clathrin-mediated endocytosis, and has since defined the molecular basis for the function of critical proteins regulating membrane trafficking and signalling at the endosome organelle. His team is now focused on understanding how discrete molecular interactions between proteins and lipids control these processes in human cells. Associate Professor Collins was awarded his PhD in 2001 and has published over 75 papers including in Cell, Nature, Nature Structural and Molecular Biology, Developmental Cell, and The Proceedings of the National Academy of Sciences USA, altogether cited more than 3100 times. He is the recipient of 3 prestigious fellowships, including a previous Career Development Award from the National Health and Medical Research Council and a Future Fellowship from the Australian Research Council, and was awarded the University of Queensland Research Excellence Award in 2008. In 2015 he was awarded the Emerging Leader Award of the ANZSCDB and in 2016 the Merck Research Medal from the ASBMB. He is currently the President of the Queensland Protein Group. The basis for movement of molecules between cellular organelles essential for cell homeostasis. The atomic resolution details of how biological molecules are assembled together and interact with each other. Trafficking is essential for normal cellular function and is perturbed in many different diseases, notably Alzheimer’s and other neurological disorders, pathogen invasion, cancer and inflammation. A/Prof Collins is probing the fundamental mechanisms of membrane transport, through the application of high-resolution structure determination, quantitative biophysical analyses of molecular interactions, and correlated cellular studies of essential protein machineries. Understanding these molecular mechanisms will allow us to determine how their dysfunction contributes to disease and how to target them for new therapies. PX-FERM proteins: A link between endosomal trafficking and signaling? Ghai, Rajesh and Collins, Brett M. (2011) PX-FERM proteins: A link between endosomal trafficking and signaling?. Small GTPases, 2 5: . The structure and function of the retrometer protein complex. Livingstone, Emma, Whitten, Andrew, Weeratunga, Saroja, Martin, Jennifer and Collins, Brett (2018). Characterisation of protein complexes essential to cellular trafficking. In: 32nd Annual Symposium of the Protein Society, Boston, MA, (175-175). 9-12 July 2018 . Gallon, M., Clairfeuille, T., Collins, B. M. and Cullen, P. J. (2014). A unique PDZ domain and arrestin-like fold interaction reveals mechanistic details of endocytic recycling by SNX27-retromer. In: ASCB/IFCB Meeting, Philadelphia Pa, (). Dec 06-10, 2014. Collins, BM and Owen, DJ (2004). Structural studies of clathrin adaptors. In: Molecular Biology of the Cell. Annual Meeting of the American-Society-for-Cell-Biology, Washington Dc, (312A-312A). Dec 04-08, 2004. How do you SNARE a synaptic vesicle?